Richard Jones' 2011 production of Puccini's Il trittico has received its first revival at the Royal Opera House (seen 29 February 2016), conducted by Nicola Luisotti and revived by directors Sarah Fahie (Il tabarro, Suor Angelica), and Benjamin Davis (Gianni Schicchi). Baritone Lucio Gallo returned to the roles of Michele in Il tabarro and the title role in Gianni Schicchi, whilst soprano Ermonela Jaho and contralto Anna Larsson reprised the roles of Suor Angelica and the Princess in Suor Angelica. 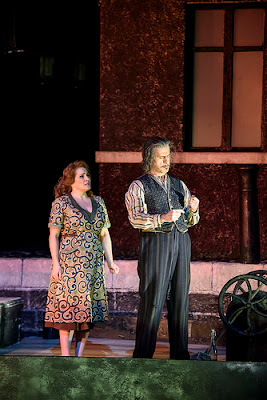 In Il tabarro, Patricia Racette sang Giorgetta with Carl Tanner as Luigi, Carlo Bosi as Tinca, Jeremy White as Talpa, Irina Mishura as Frugola. In Suor Angelica, Elena Zilio was the Monitress, Elizabeth Sikora the Mistress of the Novices, Irina Mishura the Abbess. In Gianni Schicchi, Paolo Fanale and David Kempster made their Covent Garden debuts as Runiccio and Marco with veteran bass Gwynne Howell (who made his Covent Garden debut in 1970) returning as Simone, Elena Zilio as Zita, Jeremy White as Betto, Marie McLaughlin as La Ciesca, Carlo Bosi as Gherardo, Rebecca Evans as Nella, and Susanna Hurrell (making her Covent Garden main stage debut) as Lauretta. Richard Jones' production has revived very well (of course the production of Gianni Schicchi debuted in 2009 with the remaining two being added in 2011), and to a certain extent remains the star of the evening. Despite having three different set designers, Ultz (Il tabarro), Miriam Buether (Suor Angelica), John MacFarlane (Gianni Schicchi), with costume for all three by Nicky Gillibrand, the three operas successfully form complementary parts to a whole, centred both by the common 1950's setting, and the stylised realism and detailed persononen regie of Jones' directorial approach. Puccini saw Suor Angelica as very much the centre of the triptych though the opera has been relatively neglected compared to the other two. 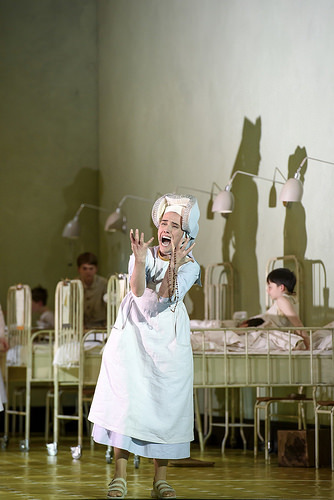 In this revival, as in the 2011 performances, Suor Angelica is certainly back at the centre thanks to the remarkably intense performance from Ermonela Jaho. 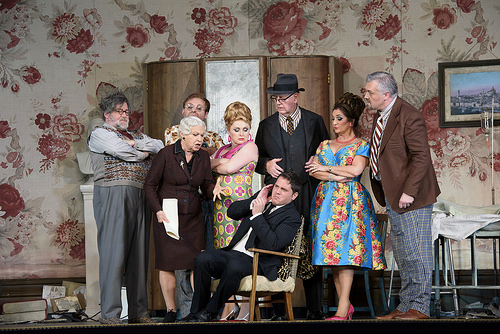 The miracle is that the relatives create such a gallery of distinct characters whilst being very funny as an ensemble: Gwynne Howell as Simone, Elena Zilio as Zita, Jeremy White as Betto, David Kempster as Marco, Marie McLaughlin as La Ciesca, Carlo Bosi as Gherardo, Rebecca Evans as Nella. The supporting characters were equally highly coloured, with Matteo Peirone as Spinelloccio, Tiziano Bracci as Ser Amantio, Simon Wilding as Pinellino, David Shipley as Guccio, Peter Curtis as the late Buoso Donati and Gabriele Montano as the chief brat.